Diamela Atencio V: All your favorite designers in one place! Don't miss our 2017 Purse Auction on June 9th! 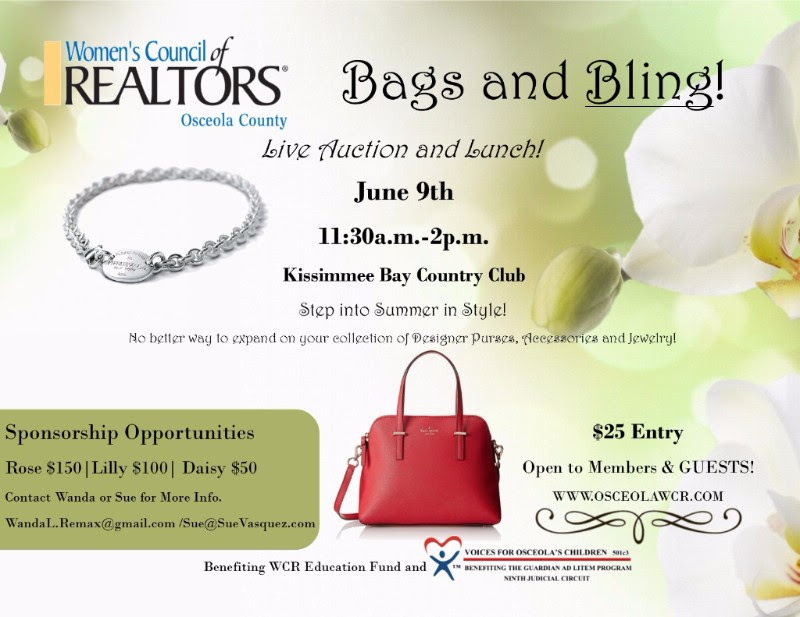 No better way to scoop up some new accessories for the summer than at the Women's Council of Realtors, Bags N' Bling! Remember this fun event is also for a great cause! A portion of proceeds will benefit our local Guardian Ad Lietem Program, Voices for Osceola's Children. Invite a friend, co-worker or neighbor! Donations of new and gently used purses and accessories are still being accepted. Clean out the closet and make room for some new additions! Nothing to donate? Consider becoming a sponsor and we'll do the shopping for you! $50, $100 and $150 Sponsorship Opportunities Available. Contact Wanda Linscott or Sue Vasquez for more information. Copyright © 2017 Women's Council of Realtors - Osceola Network, All rights reserved. We value our members and guests! Thank you for your continued involvement with the Osceola Network of Women's Council of Realtors!